Is Pumpkin a High-fiber Food? Pia Grant has been a freelance writer since 2007, writing on topics of health, fitness, diet and lifestyle. Her clients include websites, businesses and newspapers, including "The Voice" and "The Alumni." She has a doctorate degree in the health sciences and attended Loyola University. Fiber is an important part of digestive health and can also reduce your risk for serious conditions such as diabetes and heart disease. Like most fruits, pumpkin contains a good dose of fiber. Adding pumpkin to your diet will help boost your fiber intake as well as providing you with other important vitamins and minerals. The part of plant-based foods that can't be digested or absorbed by the body is fiber. Fiber bulks up your stool and eases constipation. It also helps prevent hemorrhoids and intestinal conditions, such as diverticular disease. Fiber is proven to help reduce the risk of heart disease and helps regulate blood sugar in Type 2 diabetes, MayoClinic.com notes. 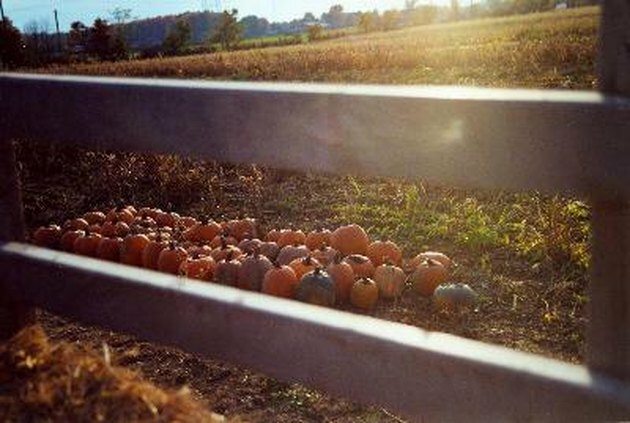 Pumpkins are squash-like fruit that grow on the vine. While 1 cup of canned pumpkin provides about 7.1 g of fiber, one cup of boiled, raw pumpkin provides 2.1 g of fiber. Pumpkin seeds also contain some fiber, about 1.1 g in 1 oz. of seeds. Many parts of a pumpkin plant are edible. Not only can you cook the shell and roast the pumpkin seeds, but you can also eat the flower that sprouts pumpkins. You can purchase canned pumpkin year-round at your grocery store or puree your own. Boiling, steaming, roasting or baking pumpkin are different ways to prepare pumpkin. And you can use pumpkin as an ingredient in soup, baked goods and pies. Adding canned pumpkin to food is often recommended as a home remedy for a constipated pet because of pumpkin's fiber content and great taste. Adult men 50 and younger should consume 38 g of fiber each day, while adult women of the same age should consume 25 g. This requirement slightly changes as we age; 30 g of fiber are recommended for men older than 50 and 21 g are necessary for women of the same age group.